March Madness begins with the NCAA Selection Show on Sunday March 16th on finishes up with the NCAA Championship on April 7th. 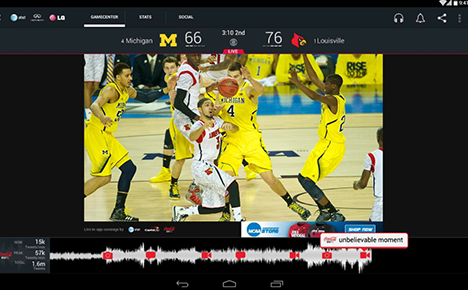 Here’s our guide to March Madness online and mobile viewing. Unless you are planning on taking a personal day or calling off from work, chances are you won’t be in front of a tv for the entire tournament. Again this year, games will be broadcast on CBS, TNT, TBS, and truTV. The good news is that every game of the NCAA Men’s Basketball tournament will be available online. The bad news is that you will need to be a TV subscriber with a qualified broadcast partner, and have TNT, TBS, and truTV as part of your package to see every game. Only games broadcast on channels your pay for via your TV subscription will be available to you online. All games broadcast on CBS are available to everyone. NOTE: Don’t forget the NCAA Selection Show will also be available online, It airs March 16th at 6:00PM ET. Games can be accessed online at March Madness Live, and this year you’ll also be able to watch from CBSSports.com, and at Bleacher Report. You can begin watching right away, but you’ll only get a 3 hour free preview window before you’ll need to log in with your TV subscriber credentials. Mobile apps are available for iOS and Android, and new for 2014 are apps for Windows 8.1, Windows Phone, and Kindle Fire. The apps have been redesigned this year with a host of new and improved features. The folks at Engadget have posted a pretty good hands on review of the apps and the new features. See the links below for app downloads. Last year (2013), I was able to essentially extend the preview limit by watching on different devices and even via VM (virtual machine) software. So, if you don’t have a TV provider, you may want try different computers and devices if you have more than one, try installing a coupe of virtual machines on your computer.